First off, excuse the horribly unclear photo, my camera decided to be annoying and I didn’t want to retake the photo, (laziness). 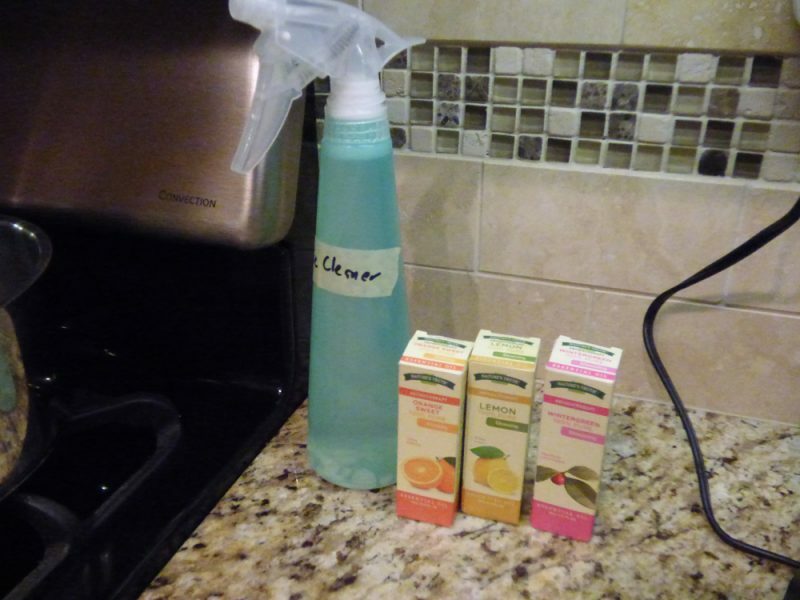 If you are looking for a natural homemade all purpose spray cleaner, look no further. This is a great one. I use it on granite countertops, toilet lids, glass, windows, and more. I haven’t been able to tolerate scents for many years now. In addition, heavy cleaners like Fabuloso, Fantastic, or anything heavy or with scent murder my lungs and give me big fragrance reactions. Instead of not cleaning, I used to use 7th generation unscented dish soap in toilets, on coutners, etc. I still do, but I supplement with this wonderful spray cleaner. 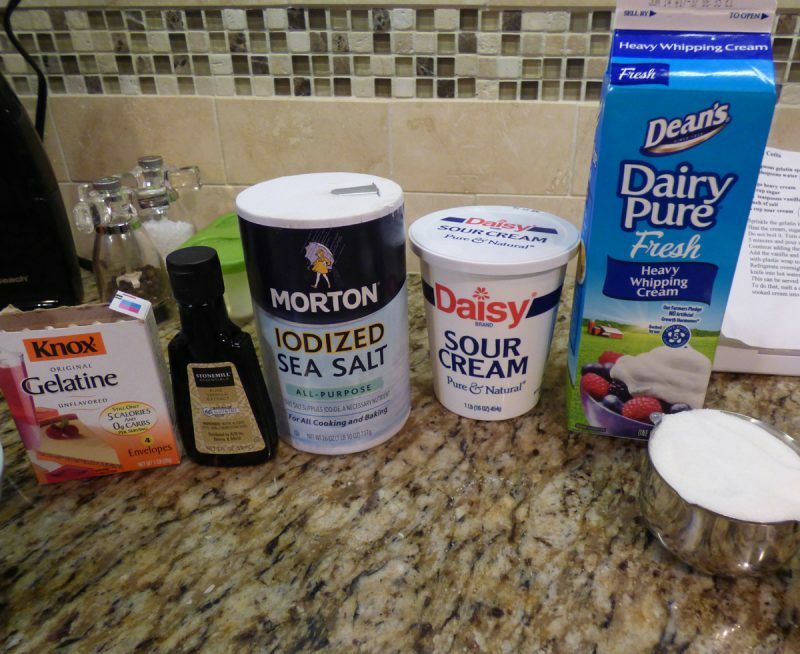 Most people have all the ingredients on hand, probably excluding the Borax powder, but it is cheap and easy to use. You will find a big box of it in the laundry department for maybe $4. Borax also descents your clothes. We are very allergic to fragrances. 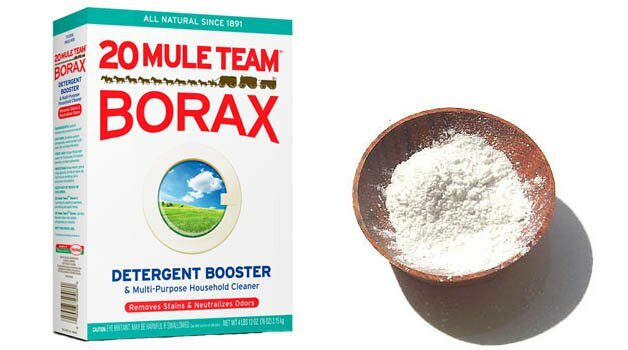 If we’ve been to a location where heavy perfumes were present and that scent seeped into your clothes, we use Borax powder in our washing machine. I put maybe a 1/4 cup into my washer, put it on the soak mode, before it starts washing. It removes most if not all of the scent. Safe essential oil scents that do not bother me are orange, lemon, and wintergreen scent. Those are my favorites. Put a funnel into your labeled and empty trigger bottle. Pour vinegar, borax, and hot water into bottle. Continue filling spray bottle with cool water, leaving enough head-space room for dish soap and essential oils. Add dish soap last. You do not need to shake this. Optional: add a few drops of your favorite essential oil, or mix a few scents for a new creation. I add about 10 drops. I finally made this Italian dessert that I’ve always wanted to try: panna cotta. It’s a cold Italian custard that magically doesn’t have eggs – great for anyone but especially my egg-allergic husband. It’s creamy, has the perfect amount of flavor, is fattening, and too delicious. It’s self-limiting as it’s high in fat and very satisfying! Don’t die without eating or making this yourself. I warned you! Only buy your heavy cream if it has one ingredient. Otherwise it’s an impostor for this recipe (or any recipe). NOTE: Use only the highest quality ingredients for this dessert. 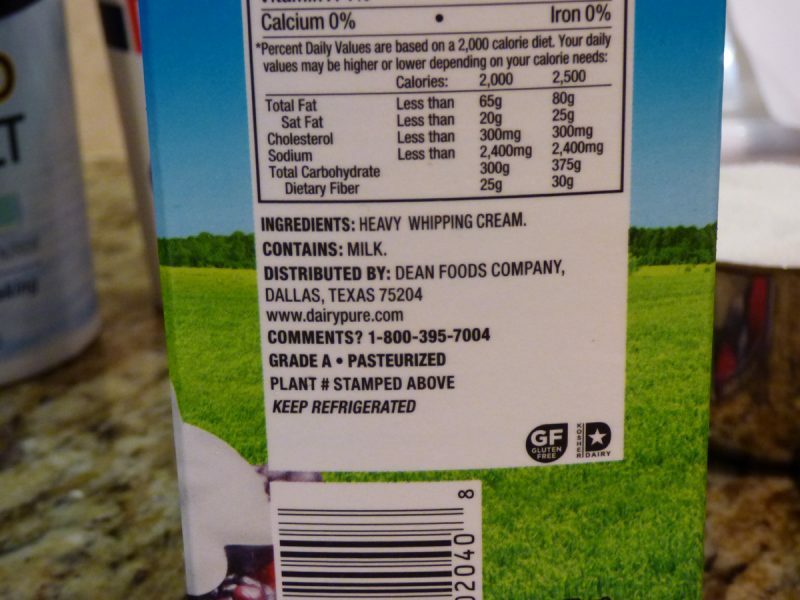 Do not use heavy cream that has any ingredient other than “heavy cream”. It shouldn’t have any additives, preservatives, or carageenan etc. DO NOT use any low fat or reduced fat ingredients. This is not the time. Only use full fat sour cream and unadulterated heavy cream. No substitutes at all. Follow the directions precisely and you will have an awesome dessert that you won’t believe. 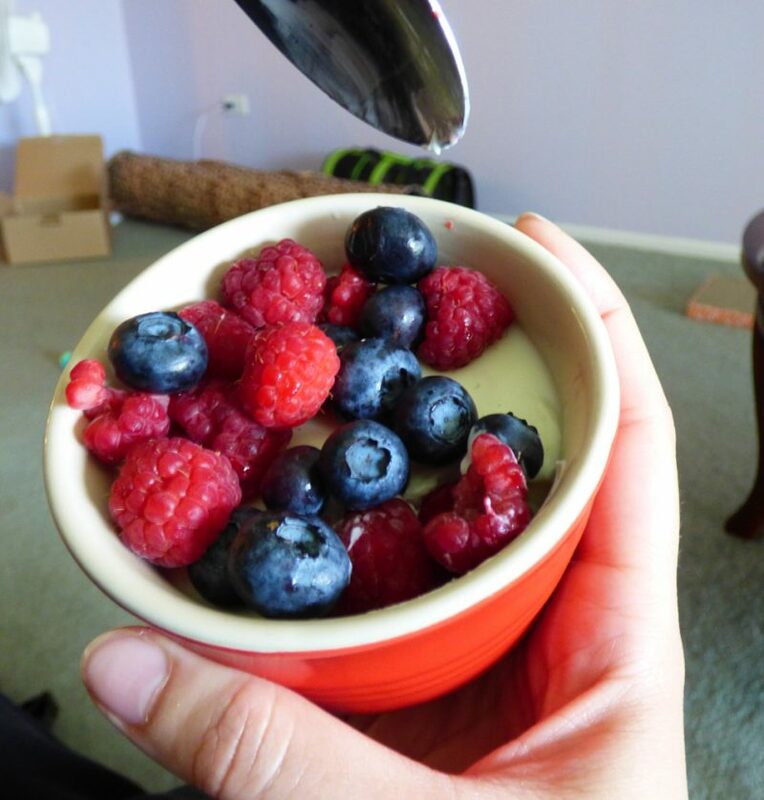 In a small bowl or ramekin: prinkle the gelatin in the room temp. water and let it sit for 5-10 minutes to gel up. Heat the cream, sugar, and salt until it’s very warm and steam starts to come off of it. Do not boil it! Turn off the heat, add the gelatin, and mix it until it’s melted. While stirring with one hand, slowly pour a cup of the warm cream into the sour cream. Mix well. Continue slowly adding the warm cream to the sour cream mixture, a cup at a time, until you’re done. Add the vanilla and stir. Pour it into 6 small, un-greased custard cups. Cover each cup with plastic wrap to avoid a skin forming. I did not un-mold them, but to un-mold: run a sharp knife around the edge. If necessary, dip the knife into hot water. Tips: This can be served with honey, fruit syrups, or add a caramel cream. I chose to go simple and just add fresh berries. This is an exceptional, savory, and yummy recipe. The textures and flavors melt together so well. It’s one of our favorites – and I’m not an extreme fan of casseroles, but this one is top notch. One of the keys is getting the spinach quite dry. I’m pretty confident you and your family will love this recipe. It works well with plain cream cheese (even Neuchatel) or the flavored chive & onion variety. Enjoy! **A can of Hunt’s basil, garlic, and oregano diced tomatoes work very well here. **Known IC irritants, tread carefully! Prepare rigatoni according to package directions. Spread oil on bottom of 11×7″ baking dish. I used a 9×13″ pan; I like a roomy dish. Add onion in a single layer. Bake at 375 F for 15 minutes or just until tender. Transfer onion to large bowl, set aside. Drain chopped spinach well, pressing between towels. 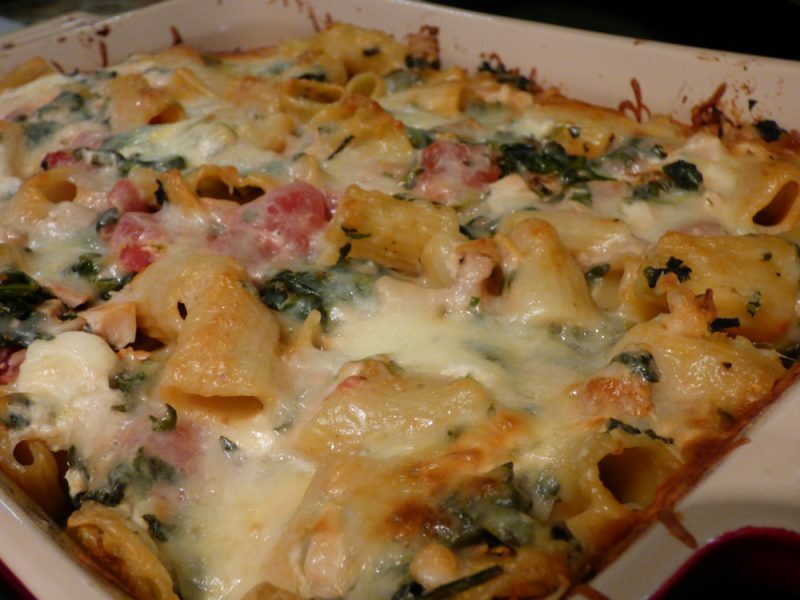 Stir in rigatoni, spinach, chicken, and next four ingredients into onion in bowl – OR add your onion powder here. Spoon mixture into dish and sprinkle evenly with shredded mozzarella cheese. Bake covered at 375 F for 30 minutes. Uncover and bake 15 minutes more or until bubbly.